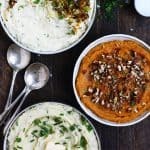 Three of our favorite ways to make mashed potatoes: Roasted Garlic, Sweet Potato with Toasted Pecans & Whipped Feta with Crispy Onions. Preheat oven to 350 F. Peel garlic cloves and place on aluminum foil. Drizzle lightly with olive oil, salt and pepper, wrap in foil and roast for 20-25 minutes or until golden brown and tender. In a large pot, bring salted water to a boil. Wash, peel and quarter potatoes. Boil for about 20 minutes, or until fork tender. Drain and return to pot. Mash potatoes with traditional masher or ricer. Add in all additional ingredients except chives. Mash until well combined and smooth. Stir in chives. Taste and add more seasoning if necessary. Garnish with additional chives. Preheat oven to 350 F. Roughly chop pecans and spread evenly on baking sheet. Toast for 4-5 minutes (stir once to prevent burning.) Let cool and set aside. In a large pot, bring salted water to a boil. Wash potatoes well (we didn’t peel them, but you can peel if you’d prefer) and cut into large chunks. Boil for about 20 minutes, or until fork tender. Drain and return to pot. Add in additional ingredients and mash well. To make these extra creamy, use a hand mixer. Top with toasted pecans & fresh thyme. Follow instructions for first recipe to roast garlic. Heat pan to medium and coat with olive oil. Slice onion thinly and add to pan once heated. Add a large pinch of salt and stir often until they begin to slightly brown. Lower heat and continue to stir occasionally to prevent complete burning. Let them slightly dry out (different than caramelized onions) and crisp up. Meanwhile in a large pot, bring salted water to a boil. Wash potatoes, peel and quarter. Boil for about 20 minutes, or until fork tender. Drain and return to pot. Using a regular blender or hand mixer, blend feta and milk until ‘whipped’ and creamy. Add to potatoes along with all other ingredients except crispy onions. Mash well until desired consistency. Taste and adjust salt and pepper as needed. Top with crispy onions, more parsley and a touch of lemon zest.